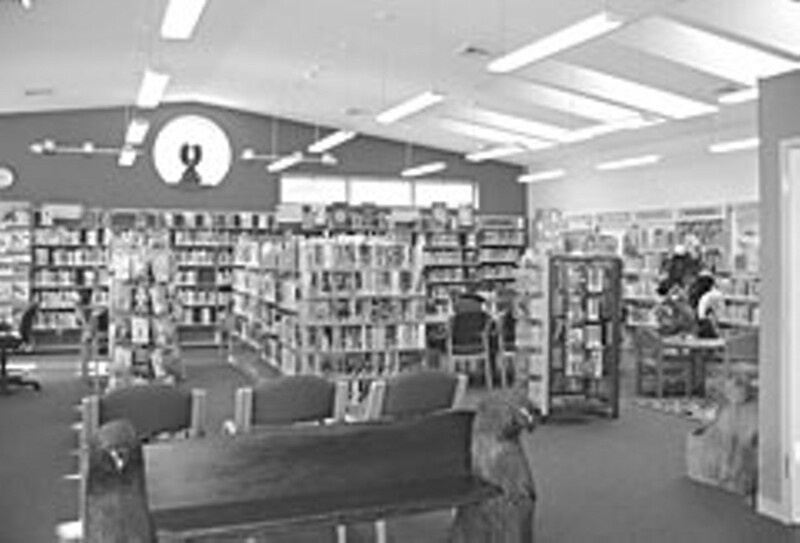 Kim Yerton Memorial Library, in Hoopa. Photo by Kristen Freeman. On a recent fall afternoon at the Kim Yerton Memorial Library, in Hoopa Valley, library branch manager Kristin Freeman described over the phone the scene inside the warm, wood structure which is shaped to resemble a xhonta, a traditional house of the Hupa people. A carved wood eagle perched in the round window, through which early winter sunlight slanted. More light flooded down from skylights onto the tables. "We've got some elders reading, a couple of people are on the computers," Freeman said. "I've got some students that just arrived from the school bus from Trinity Valley. Their parents pick them up here. I had nine to 10 kids here earlier. And this morning we had a group that meets here every week, on Fridays from 11 to 1, called Threadbenders — three people were knitting, two were quilting, one had some sewing work and one was preparing wool for spinning. Now a mom just came in with two little kids; they love the kids book section, and she goes to do the computer. Hang on a sec — I've gotta check a book out here." OK, sounds kinda like a typical library. But the Hoopa Valley library's unique. Earlier this year, it was one of five libraries in the nation, and five museums, selected by the federal Institute of Museum and Library Services (IMLS) for the 2007 National Medal for Museum and Library Service. It's the highest of honors, comes with a $10,000 award, and the little Hoopa library, tucked in the rumpled deeps of the Klamath Mountains, keeps company with big-city institutions in places like Memphis, Georgetown, Chicago and Washington, D.C. What, did the IMLS just happen to stumble down the Bigfoot Highway one day and discover the little outpost hidden away on Loop Road? 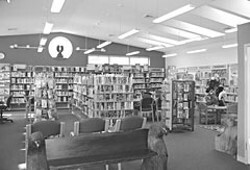 "As California's only joint county-tribal library on an Indian reservation, the Kim Yerton Branch of the Humboldt County Library has become a center for the rural community of Hoopa Valley, connecting thousands of residents of all ages with Native American reading materials, computer access and the prospect of a better life through literacy. With a poverty rate of 30 percent and unemployment at 27 percent, residents and elders in this remote region demanded something more in their library than a repository for books — a gateway not only to their heritage, but to the outside world and to upward mobility for future generations." The IMLS noted that the library, with the biggest collection of Native American materials in the county library system, is invaluable to a tribe that has only 70 living speakers of its native language left. Freeman got back on the phone. It took awhile to check out the book. "The computer's slow," she said. "I'm hoping we can use the money to upgrade the Internet from dial-up to broadband. That's my personal dream. We're 56K — I run a circulation system on that and two staff computers and four public computers." It's frustrating, because she's constantly ordering new materials for people, or filling requests from other branches. For instance, the kids in the region seem to be hooked on Japanese anime and manga — animation and comic books — right now. "We have a pretty good collection here; in fact, we get requests from other branches in the county," she said. Freeman put one of her daily visitors on the phone, 8th grader Callista Ruiz. "Everyday I check out tons of cool Japanese books and manga books and anime," Ruiz said. "I think I would go home very bored and unhappy if I didn't have a library." Finally, the Hoopa library may have the most generous open hours of any rural library around. "Generally, a library has open hours based on their book circulation," Freeman said. "We have open hours based on an agreement between the tribe and the county that this building needs to be used. It's an important gathering place, regardless of the number of books checked out."